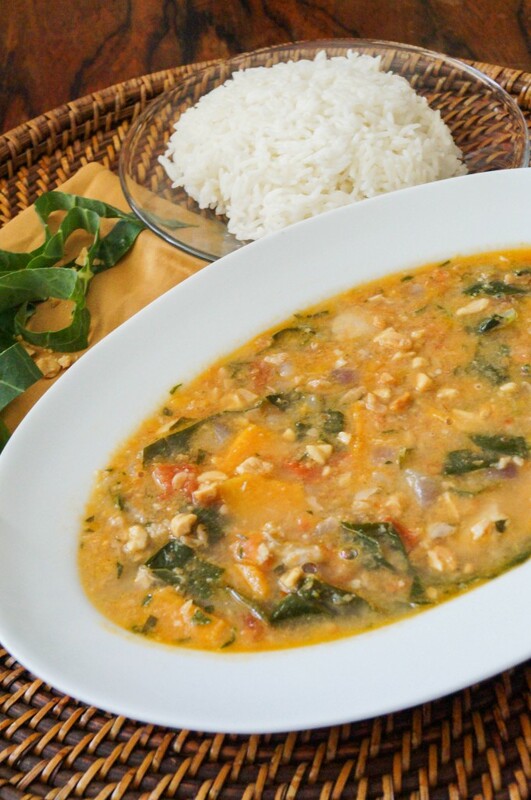 Tigadegena (Maafe, Groundnut Stew) is a West African Peanut Stew that originated in Mali. There are many variations, depending on the region and family, throughout West Africa. This recipe combines peanuts, peanut butter, tomatoes, chicken, collard greens, and sweet potatoes over a bed of rice or fonio (a type of grain common in Mali). For peanut lovers, this is a great stew to try with the inclusion of both roasted peanuts and peanut butter. I added chicken thighs to the stew, but beef and lamb are also commonly used. Yams may be substituted for the sweet potatoes. 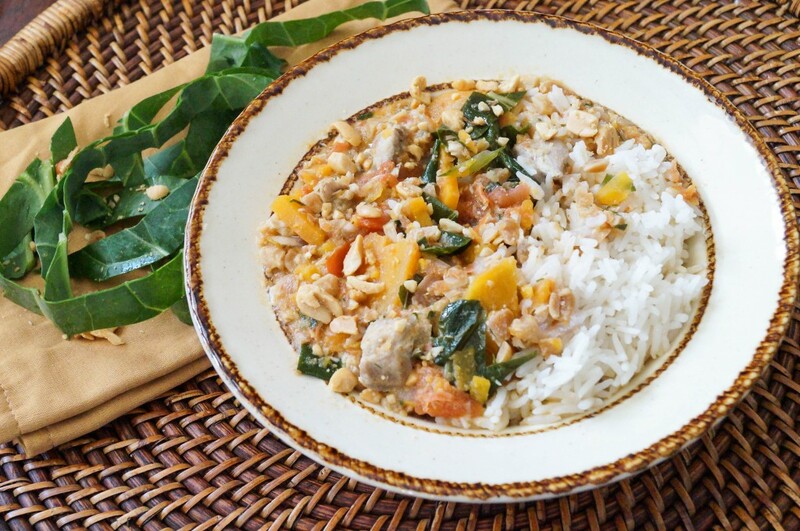 Cabbage, okra, and spinach are other vegetables sometimes added. This was a great vegetable-packed meal for Evan. He wouldn’t/couldn’t eat the collard greens in ribbon form, but had no issue after I cut them into bite size pieces. This recipe made a lot of food, so I froze the leftovers for future lunches. Place peanuts in a food processor and pulse to roughly chop. A knife can also be used to smash or chop the peanuts. In a large saucepan, heat oil over medium heat. Once heated, stir in the onion, ginger, and garlic. Cook, stirring occasionally, until the onion softens and becomes translucent, 3-5 minutes. Chop the chicken into bite size pieces and add to the pan. Cook just until the chicken turns golden on the outside. Stir in 1/2 cup of the peanuts, pinch cayenne, salt, and pepper. Add the chicken stock and sweet potatoes. Increase heat to bring to boil, then decrease heat to medium low. Stir in tomatoes and collard greens. Simmer, stirring occasionally, until the chicken is cooked through, sweet potato slices are soft, and tomatoes begin to break apart, 10-15 minutes. Stir in 1/4 cup peanut butter and slowly add more according to taste. Garnish with remaining peanuts and serve immediately with rice. I love the picture of Evan and I can’t wait to try this recipe! Thanks for sharing.